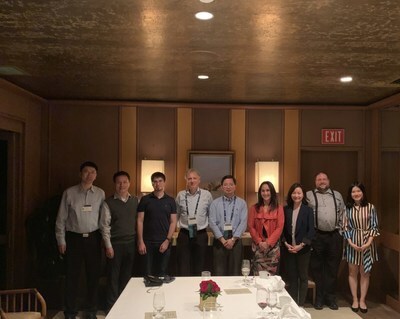 HONOLULU, April 8, 2019 /PRNewswire/ -- Squirrel AI Learning by Yixue Group, a leading enterprise in China's AI+education field, was invited to AAAI (Association for Advancement of Artificial Intelligence) conference. Richard Tong, chief architect of Squirrel AI Learning, gave a keynote speech at the conference in front of Dave Touretzky, a professor at Carnegie Mellon University, Ken Forbus, a professor at Department of Computer Science and Department of Education, Northwestern University, Chris Piech, a professor at Stanford University, and many other experts and students from the AI field. From the perspective of underlying product architecture, algorithm and principle, Richard detailed how Squirrel AI Learning applied AI to education. The participants listened carefully to his speech and had a heated discussion with the Squirrel AI Learning Team. "AI will subvert traditional education with it giving way to individualized teaching." 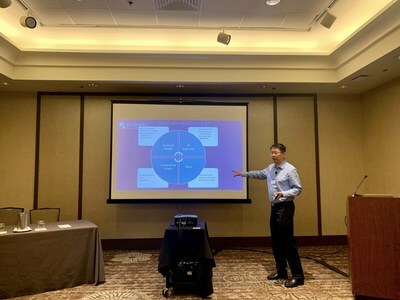 Richard pointed out at the conference that AI could solve these difficult problems faced by the traditional educational industry and make it possible to carry out individualized teaching. He said, "First, the AI engine is replacing 80% of the role of one-to-one teachers/tutors; second, AI tutors must be able to help students raise their learning efficiency, improve their performance and enhance their engagement; third, student-centered AI learning is a revolutionary paradigm shift and best able to fully promote the whole program, curriculum design, enrollment, teaching/learning, analysis/test and process improvement cycle." According to him, Squirrel AI Learning has currently achieved four global innovations in the world: Firstly, super-Nanoscale knowledge point splitting, ten times as fine as actual competitors' method. This makes it possible to accurately learn about every student's grasp of a knowledge point so that they could begin to study at a proper starting point. Secondly, splitting of learning abilities and methods. Squirrel AI Learning has figured out conceptual comprehension ability, physical law application ability, conjecture and observation ability, data-handling capacity, physical quantity estimation capacity and formula deformation application ability, which can be split to develop students' ability to infer other things from one fact. Thirdly, the association probability of unassociated knowledge points. After setting up an association probability, Squirrel AI Learning can raise its test efficiency and learning efficiency to 3-10 times as high as the ALEKS model. Fourthly, adversarial model. This model supports right-and-left mutual fight as AlphaGo Zero does, and through such training, Squirrel AI Learning can optimize the algorithm rapidly, efficiently and significantly to reduce the demand for data in an actual scene. The fact that "AI can solve educational problems" has been proved in practice. Squirrel AI Learning started verifying the feasibility of defeating human teaching with machine teaching in October 2017. It held four man-machine competitions and achieved the unusually same result: machine teaching defeated human teaching. In the largest one -- unfolded in one hundred cities, in terms of average scoring in the core part of the competition, the students in the AI teaching group had their scores increased by 5.4 on average, while the students in the human teaching group just had their scores increased by 0.7 on average; each student in the AI teaching group learned 42 knowledge points on average, while each student in the human teaching group learned 28 knowledge points on average. This means that the Squirrel AI Learning system can make and implement an individualized teaching plan in accordance with students' grasp of knowledge. Currently, a teaching effect better than human teaching has been achieved. From Richard's speech, the guests learned about the most cutting-edge development and applications of AI in the education field. With its technological superiority and excellent performance in technology-driven practical applications, the Squirrel AI Learning system has aroused great attention from experts and scholars in the international AI circle. According to Richard, Squirrel AI Learning is revolutionizing education, and every student should have a one-to-one AI adaptive tutor so that learning would be more effective, efficient and attractive. After the speech, many participants showed their keen interest in Squirrel AI Learning's technological innovation, product implementation and future development, and expressed their expectation of cooperating with Squirrel AI Learning. We believe that with the efforts of Squirrel AI Learning by Yixue Group and its peers, ideal education that features "teaching students in accordance with their aptitude" will be turned from an idle dream into a reality so that all children of different nationalities and nations, poor and rich, could have an AI super teacher of their own to enjoy the same quality education. Beyond all doubt, the Squirrel AI Learning's outstanding achievements are due to the efforts of the professional AI team. The major members of the R&D team are from Knewton, RealizeIT and ALEKS, the world's top three AI learning education providers. Of the members, chief scientist Dr. Cui Wei has a postdoctoral degree in AI obtained from the National University of Ireland. He used to be a core scientist of RealizeIT; chief architect Richard Tong is the technical leader at Knewton, the first AI education provider founded in the US, in the Asia-Pacific region; chief data scientist Dr. Dan Bindman is a co-founder of U.S. AI education magnate ALEKS, and the chief architect responsible for core product algorithm. At the global AI+ adaptive education summit AIAED held in Beijing in November 2018, Prof. Tom Mitchell, the global luminary on machine learning, Dean of School of Computer Science (CMU), Carnegie Mellon University, a fellow at the National Academy of Engineering and American Academy of Arts and Sciences, and a fellow at the American Association for the Advancement of Science (AAAS) and American Association for Artificial Intelligence (AAAI), announced his acceptance of the invitation from Squirrel AI Learning to serve as the Chief AI Officer.